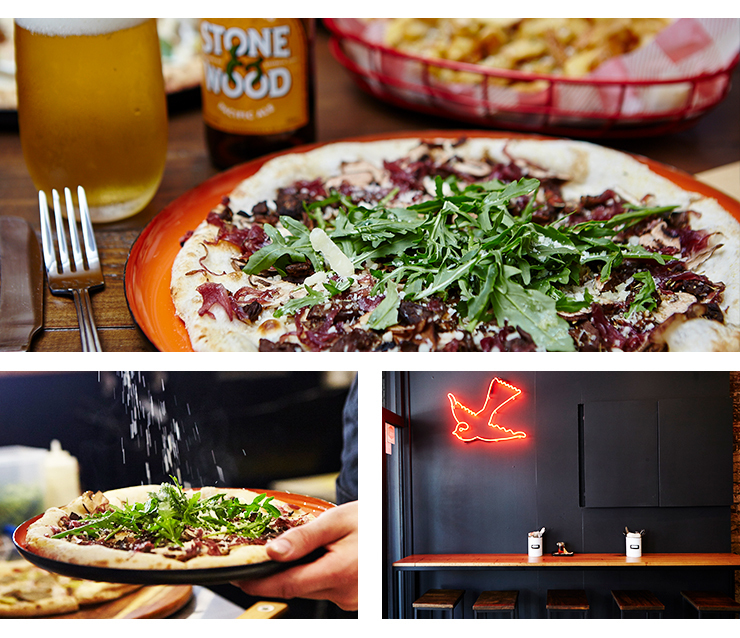 Melbourne’s First All-Vegan Pizzeria Is Here! Melbourne’s first all-vegan pizzeria may use plant-based ingredients, but don’t be fooled. Red Sparrow’s thin base, puffy-crusted pizzas can easily stand beside their more meaty counterparts. “We don’t want to be known as the best vegan pizzeria,” Red Sparrow co-owner Michael Craig says. “We want to be known as the best pizzeria.” It's a lofty goal, and from what we've seen, the team At Red Sparrow's is well on the way. The cheesy Bianca pizza is a fabulously rich place to start, especially if you’re still a bit unsure about the whole vegan-friendly dining thing. Mozzarella (non-dairy mozzarella, if you haven’t got the memo yet), potato, leeks, rosemary, parmesan and garlic confit is all served on a white base. It hits your palate with full-bodied, buttery, nutty force. The Mushroom also gets the tick of approval from my vegan partner-in-crime, who chows through it like she hasn’t had cheese on her pizza in years. A mixture of porcini, swiss brown mushrooms, caramelised onions and thyme is finished with parmesan, truffle oil, fresh oregano and rocket. I don’t attempt to steal a second slice because I don’t have a death wish. Other favourites include the Supergreen with a spinach, kale and pesto base (did someone say #fitspo) topped with zucchini, broccolini and pepitas. That’s pretty much a salad right? Specials rotate frequently, and include savoury or sweet pizzas. If you’re lucky, vegan-friendly desserts on the special board may include tiramisu. Hand-cut rosemary chips, dips and a small selection of salads work great as starters, while drink choices are kept simple: think pressed juices and tap beer. Keep an eye out for the neon red sparrow as you walk down Smith Street. The restaurant's interior is a delightfully rustic mismatch of exposed brick, sleek black tiles and warm timber. Fluffy, pizza-loving, four-legged creatures are also welcome at the small outdoor seating area. Expect lines on the weekend (or really, most nights of the week). It's not only vegans flocking to Red Sparrow for a well-deserved cheesy, carby feast. Any self-declared foodie won’t be able to resist the promise of a quality pizza—vegan or not. Maybe looking for something a little carb-er and definitely not vegan? Check out Melbourne's Best Nutella Pizzas.